Homemade Whole30 BBQ Sauce is so easy to make and is ready in 2 minutes! No cooking required! 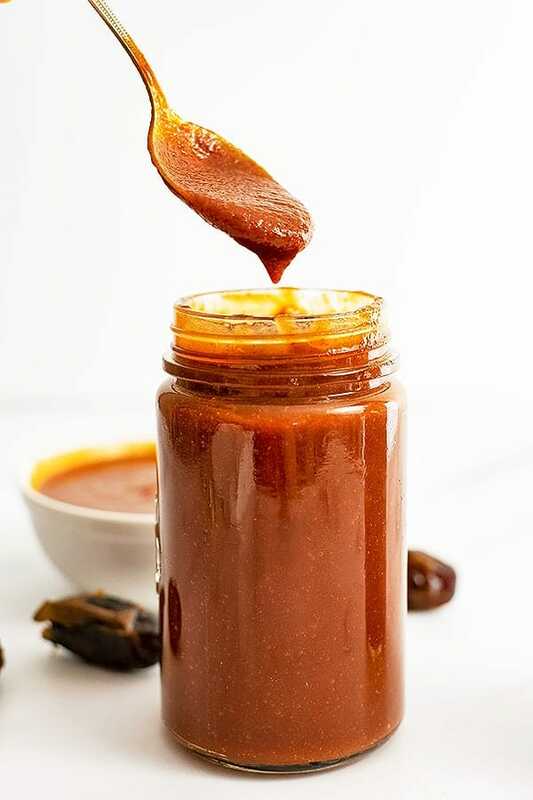 This simple healthy recipe for BBQ sauce is vegan, paleo, refined sugar free and Whole30 friendly! Finding a barbeque sauce that is not full of sugar and added junk in the grocery store is tough! 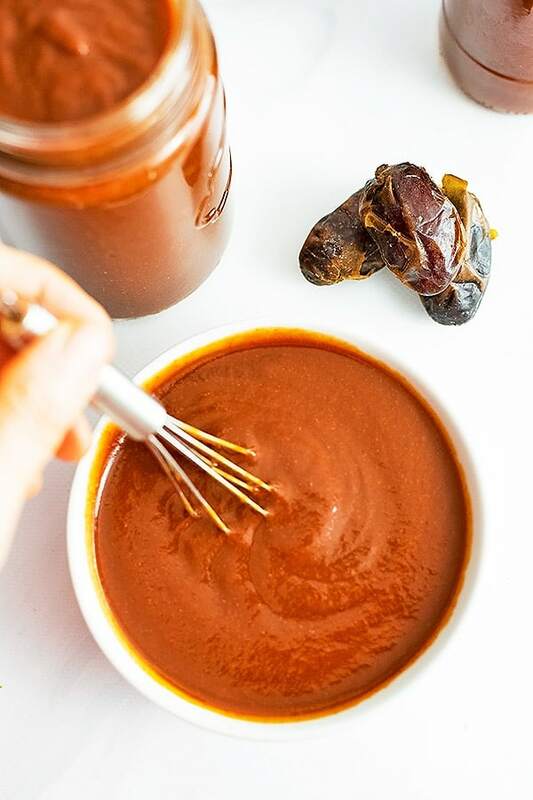 Luckily, making a Whole30 friendly BBQ sauce at home is super simple and only requires a few ingredients, most of them you likely have on hand right now! 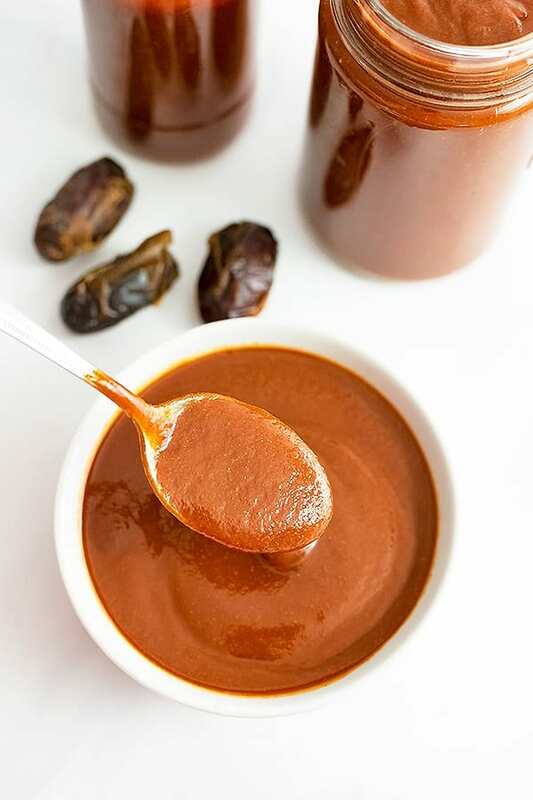 And the added bonus is that this homemade Whole30 friendly BBQ sauce is a very economical option, as most of the ingredients are pantry staples and can easily be bought at Trader Joe’s or the regular grocery store! How do you make homemade Whole30 barbeque sauce? In a large mouth pint sized mason jar, add all the ingredients (be sure you remove the pits from the medjool dates). Use an immersion blender (affiliate) to combine all the ingredients, blending for about 2 minutes total, making sure the dates are finely chopped. If you don’t have an immersion blender, you can also add all the ingredients to a high speed blender and blend on high for 1-2 minutes. Can you make this Whole30 BBQ sauce without dates? Yes, you could use raisins, dried cranberries or even dried apricots instead. You would want to use about ¼ cup of these items if you substituted them for the dates. If you are making this recipe and you are not following Whole30, you could use 3 tablespoons of maple syrup or honey in place of the dates. What if you can’t find a compliant dijon mustard? If you cannot find a compliant dijon mustard you could use yellow mustard or even just mustard powder (about ½ teaspoon of ground mustard powder). What to do with extra barbeque sauce? This recipe makes about 2 cups of Whole30 friendly BBQ sauce. You can store the barbeque sauce in the fridge (in a sealed container) for about 2 weeks time. The bbq sauce can also be frozen into single serving cubes (I love these silicone molds (affiliate)). This way you would have single serving amounts you could easily defrost and use for dinner anytime. 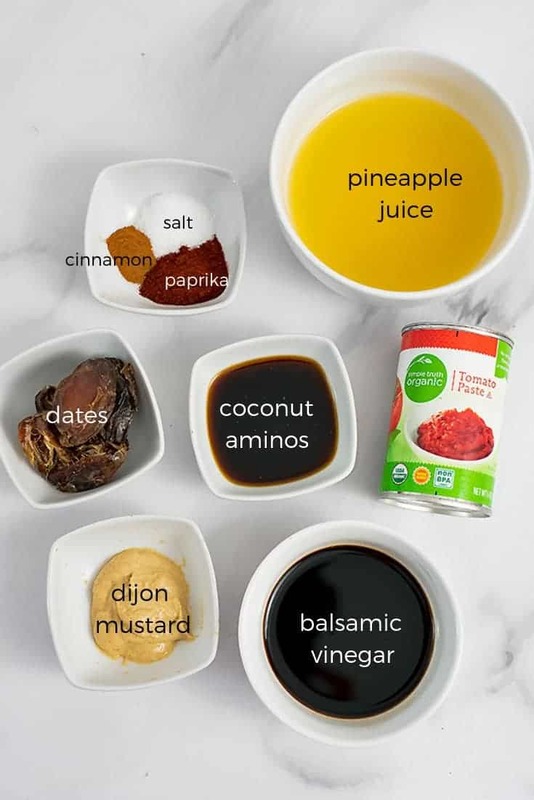 If you wanted to make big batches of this Whole30 barbeque sauce, you can also freeze it in mason jars or in freezer safe bags! Tip: If you do choose to freeze this in bags, it can be helpful to double up on the freezer bags in case one of the bags gets a hole or leaks. This simple BBQ Sauce comes together in 2 minutes! See how easy it is to make in the below video. 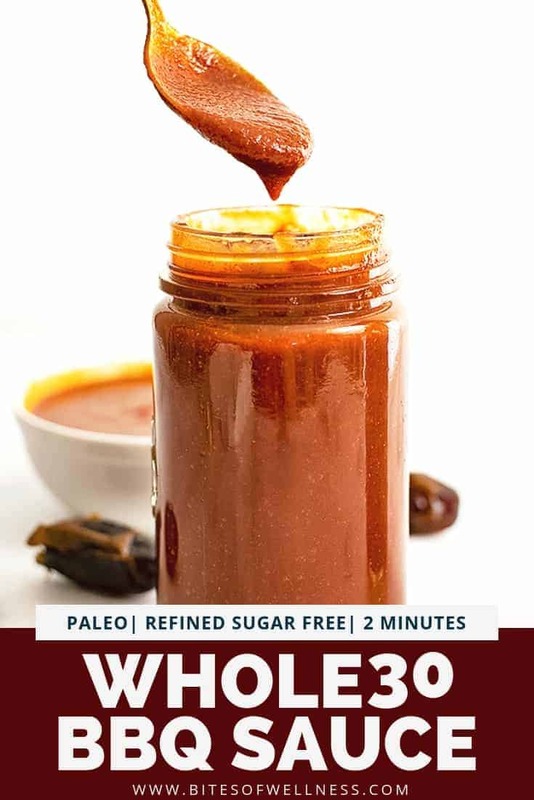 Homemade Whole30 BBQ Sauce is so easy to make and is ready in 2 minutes! No cooking required! 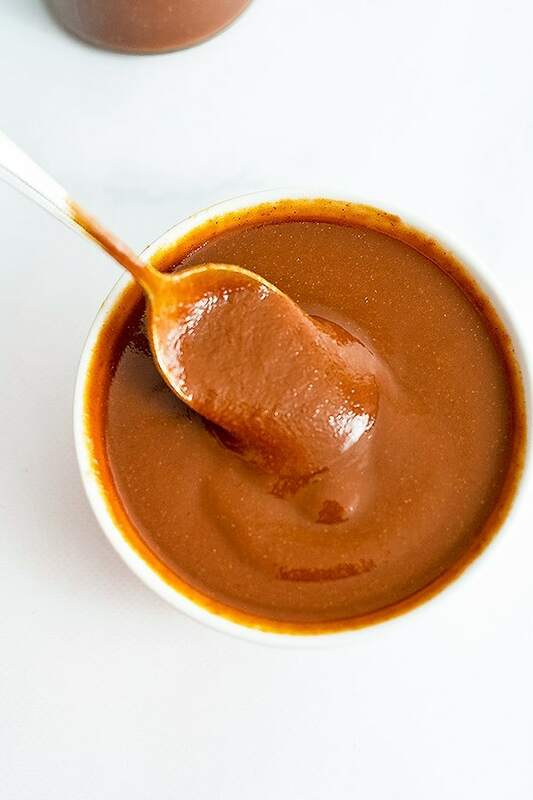 This simple healthy recipe for barbeque sauce is vegan, paleo, refined sugar free and Whole30 friendly! Add all the ingredients to a large wide mouth mason jar. Store in the fridge in a covered container for 2 weeks or freeze.